Carlos Evaristo Flores practices primarily in the area of civil litigation and has successfully litigated cases ranging from complex commercial disputes, property disputes, personal injury cases, products liability, labor and employment matters and family law cases. 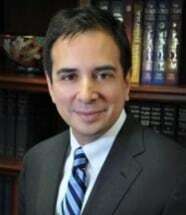 Mr. Flores has represented a diverse set of clients in state and/or federal courts in Webb County, Zapata County, El Paso County, Hudspeth County and/or Bexar County. Mr. Flores was born in Laredo, Texas but lived in El Paso, Texas from 2005 through 2010. In 2007, Mr. Flores was appointed to serve as a trustee for the El Paso Independent School District Board of Trustees. During his tenure as a trustee, Mr. Flores fought for governmental transparency and accountability to taxpayers. Mr. Flores was a strong advocate for students and fought to increase dual-language and fine arts programs to supplement student achievement in state-mandated exams. Mr. Flores currently serves as a commissioner for the City of Laredo's Ethics Commission. Mr. Flores is fluent in Spanish and familiar with the legal issues that arise in the bilingual and bicultural Texas-Mexico border region.